Do you want to add social share buttons to your images? Adding social sharing buttons to your photos is an excellent way to spread the word and get more eyes on your work. In this tutorial, we’ll share how to add social share buttons in WordPress image galleries. Social sharing helps you to display your photos to a larger audience through different social channels. Getting all those shares and increased traffic is also a good factor for search engine optimization. In WordPress, you can’t add social share button to image galleries by default. You need to take help from a plugin like Envira Gallery. 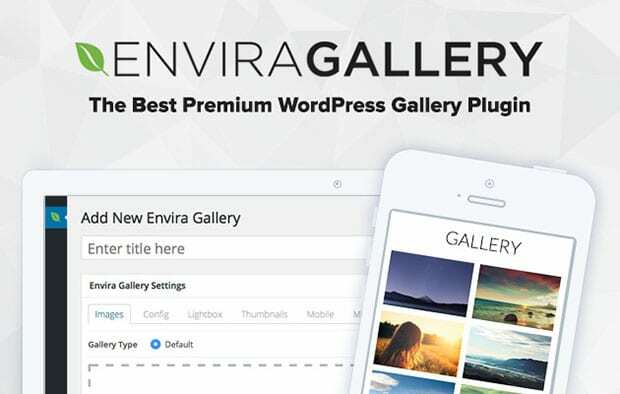 First thing that you need to do is to install and activate Envira Gallery plugin at your site. Need help with installing the plugin? You can learn here about how to install a plugin in WordPress. 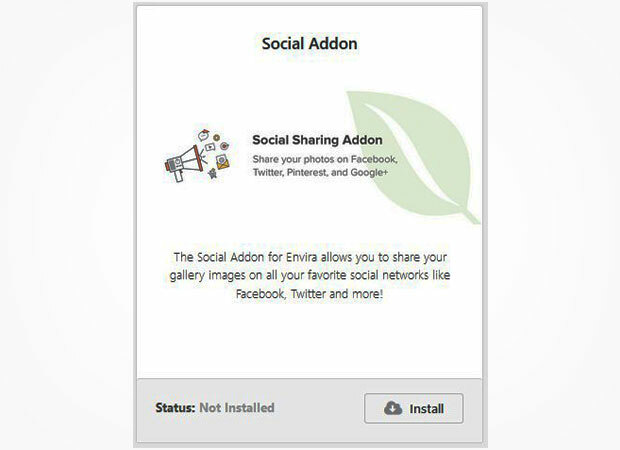 Upon activating the plugin, you can go to Envira Gallery » Addons to install and activate the Social Sharing addon. To access this addon, you must have Envira Pro or Ultimate license. You can upgrade your license here. Once the addon is activated, you can create your image gallery to add social share buttons to your photos. 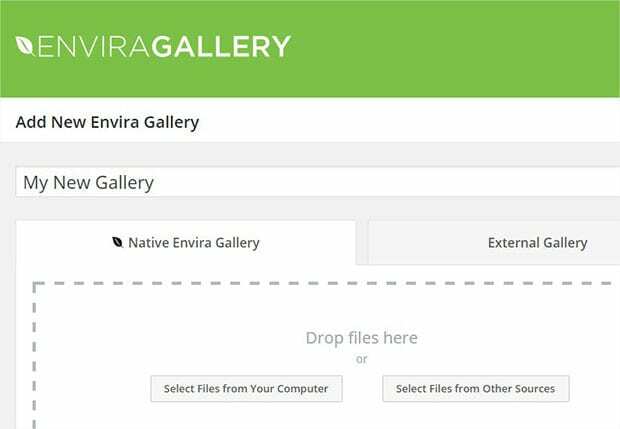 To create your gallery, you’ll need to go to Envira Gallery » Add New. Simply add a title and choose your photos for the image gallery. To learn more, you should check out this guide on how to create an image gallery with thumbnails in WordPress. After adding photos to the image gallery, you’ll see a message to configure Facebook and Twitter at the top of the WordPress backend page. Go ahead and click on the Settings link. You need to go to the Social tab from top of the page. Add the Facebook app URL and Twitter username in the given fields. You can click the documentation links for detailed instructions. Now edit your image gallery from Envira Gallery. You need to go to Social tab to enable it. You can enable the social share button for thumbnails and lightbox separately. There are multiple social channels to choose from. You can also set the position and orientation of the social share buttons. 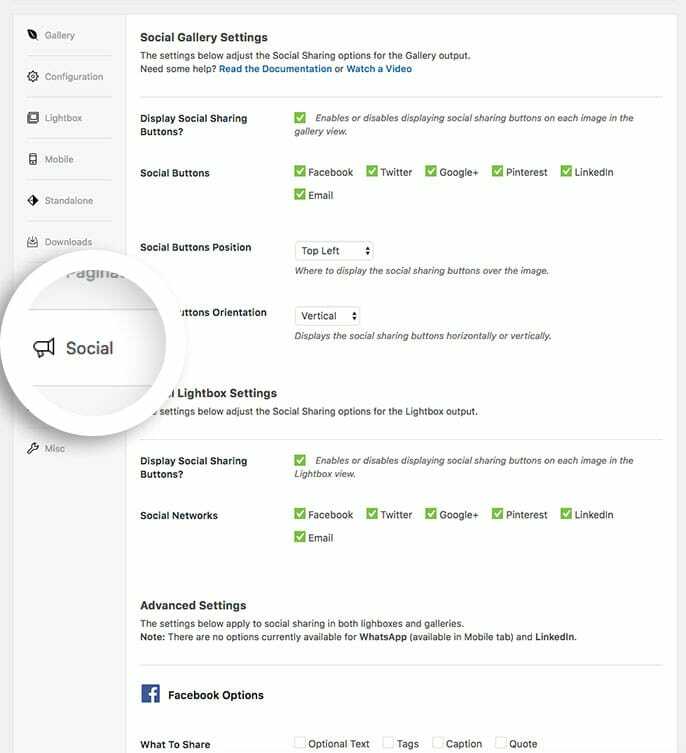 Additionally you can scroll down to Advanced Settings to customize your sharing options for Facebook, Twitter, Pinterest, and Google+. Now that you’ve added the social share buttons to the images, simply hit the Publish button. You’ll see a new widget in the sidebar with shortcode and some other information. 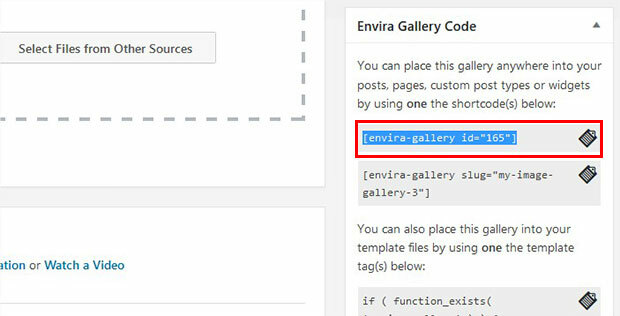 You need to copy shortcode from the Envira Gallery Code widget. Next you need to go to Posts » Add New or edit an existing post. 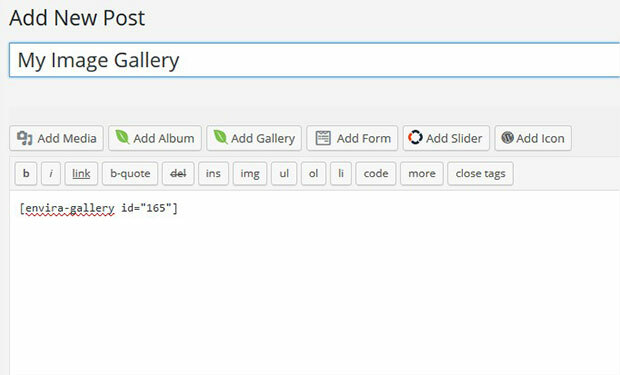 In the visual editor, simply paste the shortcode where you want to show this image gallery. Make sure to update the post. Now go to your site to see the social share buttons added to your images. That’s all. We hope this tutorial has helped you to learn how to add social share button in WordPress image galleries. You may also want to check out our guide on 9 tools to create better images for blog posts and social media. If you like this tutorial, then please follow on Facebook and Twitter for more free WordPress tips and resources. Just found out about this feature. Looking forward to using it in future projects. Bought this product purely with the expectation that this would also allow a “Like” button versus the “Share” capability. Doesn’t seem to have this. How can I achieve this?